We need to go out and about – leisure, work, school, shopping, doctors’ surgeries and hospitals and having a car is seen as essential by most residents, but not everyone can drive. Once there were buses through Frilsham but over the years the daily service dwindled to a couple of days a week, then once a week and then it was gone. How did this happen? The buses were under–used with people saying the services “did not meet their needs” or they “preferred to use their own cars”. 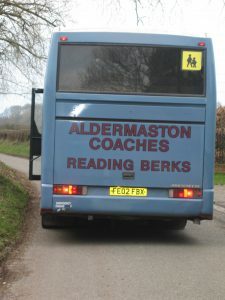 Pupils who attend The Downs School travel there on the school bus. 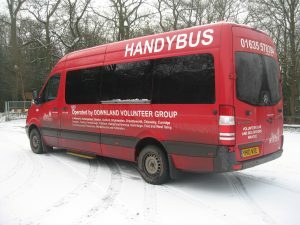 Several of our older village residents no longer drive and are helped out by their relatives or willing neighbours. Also the Downland Volunteer Group (DVG) operates a minibus that is available to older people and people with a disability. The bus leaves Frilsham every Monday (except Bank Holidays) at around 10:00 a.m. for Newbury Town Centre and then Sainsbury's. It returns to Frilsham at around 1:45 p.m. There is a small charge to use this service. or visit the DVG website.